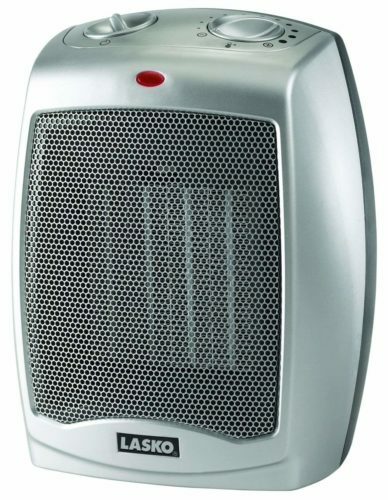 Lasko Electric Ceramic Heater in Silver for $14.88 (Reg.$35)! Walmart or Amazon has Lasko Electric Ceramic Heater in Silver for just $14.88 (Reg.$35)! 3 Quiet Settings – including high heat, low heat, and fan only make this electric space heater ideal for warming up an area in your home. Combined with an adjustable thermostat this personal space heater is great for small areas. Adjustable Thermostat – allows you to adjust the heater’s 1500 watt ceramic heating element. With 11 different temperature settings you’re sure to find a comfortable setting. Simply turn the dial to the heat setting you desire and enjoy comforting warmth. Convenient Carry Handle – makes it easy to move the space heater. Thanks to the heater’s compact size and convenient carry handle you can easily move the heater from the kitchen, to the bedroom, or even under the desk. Built-in Safety Features – overheat protection ensures the space heater does not overheat even if left on for an extended amount of time. The space heater also features a cool-touch exterior. This allows the the space heater’s body to stay cool even when it’s on high. Fully Assembled – allows you to take the heater out of the box and have it working in minutes. Simply plug the heater into a wall outlet, select your desired heat and thermostat settings, and enjoy the warmth from your new Lasko space heater.